What do you do when a client seems to deny there’s a problem but you can see it as clearly as the nose on their face? Sometimes a client or someone you know (not you of course!) seems to be ‘in denial’. Denial is a kind of emotional defence mechanism in which conscious recognition of a personal issue is avoided and the existence of the problem is denied and therefore ignored. Depending on what the problem is, denial of a problem may make it worse. How complicated we human beings can be. Human nature – who needs it? And now you, the practitioner, have a problem. You suspect that, deep down, they suspect that there really is a problem. The elephant has rung the doorbell, entered the house, and is sitting squarely in the room. At least our huge but seemingly unnoticed house guest is visible to you if not to your client. To get all Donald Rumsfeld about it, they know, but they don’t know that they know. We can deny something not because we are lying (although we can do that too!) but because we shift our beliefs to fit whatever worldview suits us. I have sat in front of hollowed out, wheezing and prematurely aged smokers assuring me between harsh coughs that smoking doesn’t impact their health. They just want to quit to please the wife, or to spend less cash. Fair enough, we might say. It can be hard to admit to chipping away at your own mortality, especially if you view yourself as someone who ‘values life’. A part of them knows, but it is staying hidden, protecting the conscious part that needs to hold fast to that belief or face major discomfort, embarrassment or even terror. This is why denial has been called a ‘defence mechanism’. It can maintain the illusion of emotional equilibrium. But the discomfort is still there. The knowledge of the real situation is in there somewhere, no matter how deeply shrouded in rationalizations – and it gnaws away at you. The elephant in the room may be invisible, but the furniture is still getting trashed. Denial is used when cognitive dissonance gets too close for comfort, when each time you blink and open your eyes again that pesky elephant has gotten closer. So what is cognitive dissonance, and why does it matter? In 1957 Festinger infiltrated a Chicago-based flying-saucer cult run by ex-scientologist Dorothy Martin, who had apparently been receiving warning messages from aliens from the Planet Clarion (as you do). Apparently humanity was going to be flushed from existence by a Genesis-like flood at precisely midnight on 21 December 1957. But the ‘Seekers’, as the cultists called themselves, would be whisked away by a flying saucer from the planet Clarion while everyone else drowned or at least got inconveniently wet. Many of the cultists had given up money, homes, familial and other relationships to join the doomsday cult. They were invested in their belief. Festinger, pretending to be one of them, wanted to see how they’d react when this didn’t happen, which of course he assumed it wouldn’t. Well, here’s some news for you. The world didn’t end at midnight on 21 December 1957! So what happened next? How did the Seekers react? Midnight on 21 December 1957 rolled around and… nothing. No flood. No end of the world. No spinning, selective flying saucer from Planet Clarion to the rescue. Nothing. Festinger waited. Just how would the Seekers explain such clattering, disconfirming feedback? How would the disappointed cultists react to the failure of their prophecy? Would they be embarrassed and humiliated? They would at least admit they were wrong, right? What happened next amazed him. Now the cultists, who had until now been avoiding publicity, actively sought it. They wanted to tell the world what a near miss it had been. How their faith and the power of their true belief had saved the world from catastrophic flood! They had actually managed to rationalize this glaring belief/reality clash. Wow! All that horrible conflictual discomfort evaporated (for the time being). Festinger was flabbergasted, and absolutely fascinated. Thus his concept of cognitive dissonance was born. He observed that the real driving force behind the cultists’ apparently inexplicable response was the need not to face the awkward and uncomfortable truth and ‘change their minds’, but rather to ‘make their minds comfortable’ – to smoothe over the unacceptable inconsistencies. And we all have a valuable lesson to learn from the Seekers. Festinger found that many of us use this cunning unconscious emotional mechanism in our everyday lives (in less dramatic ways, of course!). This kind of denial isn’t lying as such; it’s simply what we humans do when we experience the discomfort of cognitive dissonance. When reality conflicts with our beliefs, we have to either justify or rationalize that reality, or deny it. We try to reduce the ‘dissonance’ between how we think things should be and how they actually are. Self-objectivity, and therefore increased self-knowledge, negates the need for denial. We might have to tough out the discomfort, fear, embarrassment or anger of seeing the elephant in our room that others may well have been aware of from the beginning. But once we’ve seen the elephant, at least we have the opportunity to do something about it. If I decide not to do something because I’m scared I might fail, I might feel uncomfortable about being such a wuss! But if I create reasons other than cowardice for not going to that party or not going for that jog in the park, I can avoid that discomfort. If I don’t believe myself to be anxious, or lazy, or whatever the case may be, then when I behave in ways that conflict with that belief I can call on my secret tool – denial – to maintain my ongoing sense of self: what I believe I am like. Pretty cool eh? But hold on. Not so cool. The mania for “positive self-talk” is all very well if it has positive results. But encouraging people to always use positive self-talk may be akin to producing a horrible feeling of inconsistency within them, like artificially manufacturing the discomfort of cognitive dissonance. This may be why those with low self-esteem tend to feel worse after using positive affirmations. Artificially inducing cognitive dissonance with self statements that so obviously conflict with a person’s sense of reality can really hurt them. Positive self-talk can also have negative results if it stops us from accepting challenges. I can positively self-talk myself into a life of missed opportunities and inactivity as long as I maintain the capacity to assuage uncomfortable inner dissonance through denial. This isn’t to say some denial doesn’t help us sometimes. But if it becomes a sweeping lifelong habit we live less authentic lives. Sometimes our clients seem to not want to face truths that need to be faced. Firstly, we can bear in mind that we might be wrong. Maybe this client isn’t in denial. Maybe we are making unfair assumptions, perhaps because of our training. For example, just because someone has been through terrible times doesn’t automatically mean they must be traumatized by them. Even if someone does seem to be in denial, we don’t need to assume they must be made to see what seems to be the glaring truth. Maybe for now, or maybe even forever, they can keep the comforts of their beliefs and we can work within those frameworks to help them. After all, we always need to build and maintain rapport with our clients. We need to be loose in our assessments. Your client might be in denial. But if, as time goes on, you do feel you need to dispute irrational or self-destructive beliefs, there are subtle ways of doing this that don’t have to threaten rapport. Observe what people do, not just what they say. Usually denial emerges as we continually observe how someone’s actions, emotions and words seem at odds with one another. A client once told me she was no longer attracted to a married man she’d had an affair with. Not only did she shake her head when she told me this, she later let slip that she would check his Facebook page up to ten times a day! Her actions and facial expressions seemed to mismatch her words, and I began to suspect she may be hiding something from herself or me or the both of us. Why does your client seem to be in denial? What does their belief that seems so obviously to conflict with observable reality do for them? What need or needs might it meet? The need for a sense of purpose. These are all natural needs, but if we meet them in ways that conflict with reality then, when faced with that reality, we may rearrange our whole belief system rather than jettison a conflicting belief and risk losing the fulfilment of these needs. If you help your client meet their needs legitimately in healthy ways, cognitive dissonance and the resulting denial become unnecessary. Or, to put it another way, once needs are met healthily, there is nothing left to fuel the denial and its associated erroneous beliefs, and the client can take on a more measured relationship to reality quite naturally. If you feel it necessary, use metaphor to help deal with what seems like chronic denial of realities in your clients. Addressing denial not head-on but metaphorically facilitates a more gradual adjustment to the harsh light of truth. 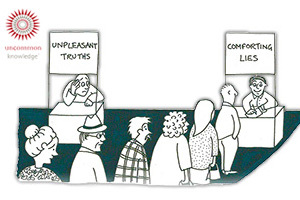 If someone is ‘in denial’ because of cognitive dissonance, it’s because the truth is somehow painful to them. We as practitioners need to respect that and understand that direct confrontation may just make them clench the mental mechanisms of denial even tighter around their ‘convenient’ (versions of) truth. We can use metaphor to suggest what the underlying pattern might really be, as I suggest in the audio clips above. This can help the client save face and seem to come to adopt a new perspective on their own, spontaneously, rather than feeling we have spoon-fed them the truth of a situation. And here’s a metaphor I sometimes use about the elephant in the room. Although here the elephant becomes a scary giant. Once a little boy decided to confront the terrifying giant who appeared on the horizon every day. As he walked toward it, a strange thing happened. The closer he got, the smaller the giant became. Eventually, he was able to hold the ‘giant’ in his hand. “What is your name, O creature that shrinks as I approach you?” asked the boy. And you can learn more about using language to change your clients’ perspectives with our Conversational Reframing course. Read about the course and sign up to be notified when it’s open for booking here.